Bergen is now running into the second season in the Q4 Bathrooms Brochure, after its release in the Autumn/ Winter 2017 Brochure with great success, additions are now been made to this already stunning range. 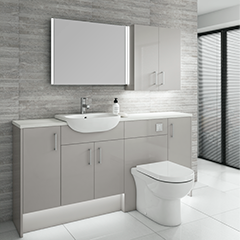 Bergen fitted furniture offers you the choice to customise each aspect of your bathroom furniture, whether it’s slimline units or standard depth, the carcass colour, fascia colour right down to finishing them off with the finer details. The right lighting is imperative, whether it’s main lighting or side lighting. Bergen are proud to introduce the LED Plinth Lighting Pack, this luxurious lighting will bring an air of elegance to any bathroom. Highlighting the plinth and floor area, the LED’s are hidden away out of view, this can be operated in two ways, in the absence of an IR switch a standard light switch can be used. Browse through our extensive range of Bergen to create a practical and stunning piece of bathroom furniture.If you would like any further information on Bergen please contact the sales team.